Preheat oven to 350 degrees. Whisk dry ingredients together in a bowl. In a separate larger bowl, combine oil, vanilla, sugar, egg, and milk. Add the dry ingredients to the wet ingredients. Mix just until all combined. Spoon the batter into prepared muffins--either a lightly greased muffin tin or line with paper or silicone muffin cups. Bake for 15 to 20 minutes. While muffins are baking, prepare your topping. Melt butter in one bowl and mix cinnamon and sugar in another. Remove muffins from pan while still hot. Dip muffins in melted butter. 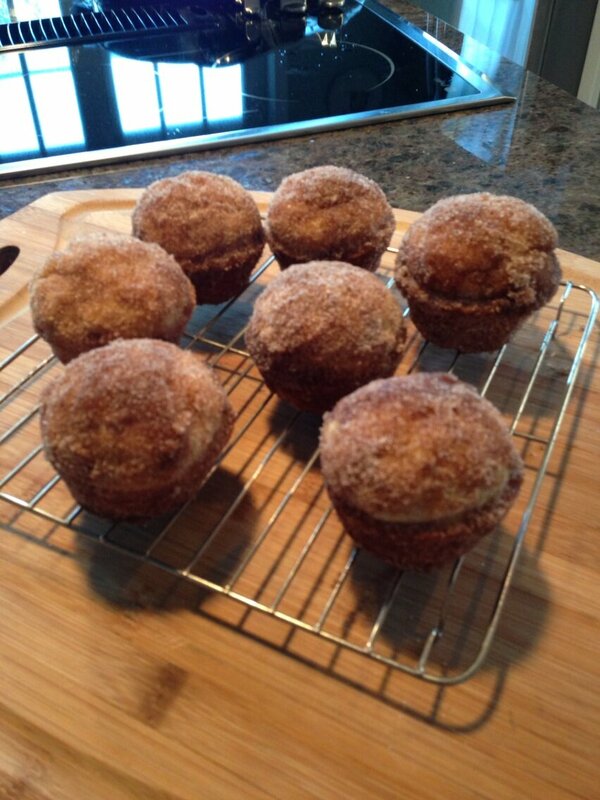 Then roll muffins in sugar mixture. Serve warm or cool on rack. Store for a day or so at room temperature. (if they last that long!) Makes about 8 to 12 muffins. Enjoy! Heat oven to 350 degrees. Lightly grease bottom/sides of 13x9x2 pan. Cut butter into cake mix in med bowl, using pastry blender or fork, until mixture looks like fine crumble. Press half of it in the bottom of the pan. Bake 10 minutes. Then sprinkle with chips. Then drop frosting by tablespoons over the chocolate chips. Stir milk into the remaining cake mixture and drop by teaspoonfuls onto the frosting mixture. Bake 25 to 30 minutes or until cake portions are slightly dry to touch. Cool completely, then refrigerate until firm. Cut into bars. Place all in food processor until smooth. Season with salt and pepper. Serve with pita chips or carrot sticks. Preheat oven to 350 degrees. In a large mixing bowl combine the filling ingredients. Mix blueberries, Grand Marnier, nutmeg, granulated sugar and 1/2 cup of the flour. Toss to mix and let sit for 15 minutes. Grease a 9-by-13 inch glass ovenproof baking dish with 1/2 teaspoon of the butter. Spread the berry mixture evenly in the baking dish. In a small mixing bowl, cream the remaining stick of butter with the brown sugar until smooth. Add the cinnamon, the remaining cup of flour and the oats. Mix well. Spread the oat mixture evenly over the berry mixture. Bake for 30-50 minutes until lightly golden. Remove from the oven and let cool slightly. Crush half a bag of Oreos, and line the bottom of a trifle bowl (or you can use a 9X13 pan). Take one package of cream cheese, about a cup and a half of peanut butter and a cup of powdered sugar beat. Fold in a little more than a third of the giant tubs of Cool Whip. Add to pan/bowl. Crush and add 1/4 of the package of Oreos. Take two boxes of instant chocolate pudding. Add only three cups of milk, beat. Fold in another 1/3 of Cool Whip. Add to pan/bowl. One box of instant vanilla pudding, 1 1/2 cups of milk. Beat. Fold in the last 1/3 of Cool Whip. Add to the top of chocolate pudding. Top the dessert with the remaining 1/4 of the Oreos...crushed.